Bozeman’s religious leaders, community activists and law enforcement wanted to make one thing absolutely clear. Bozeman is a hate-free zone. 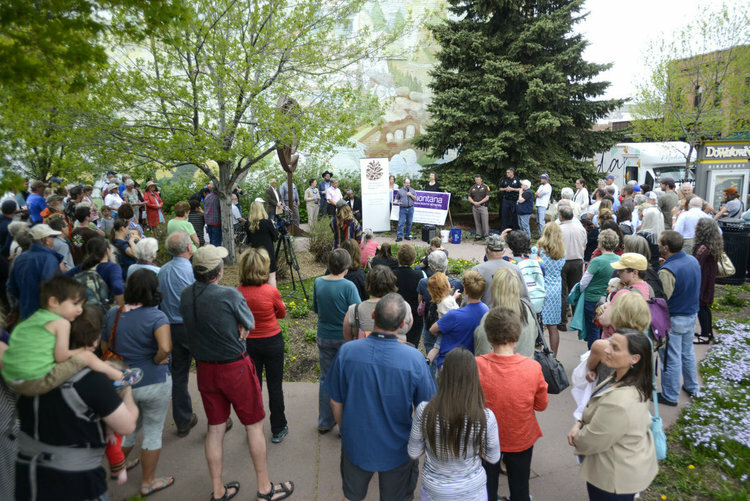 That was the message of an event Thursday evening at Soroptimist Park in downtown Bozeman, where more than 100 people gathered in response to anti-Semitic fliers that were dropped at homes in Bozeman neighborhoods over the weekend. Taylor commended the outrage of the folks who received the fliers, saying the city would use any means it could to protect citizens from hate crimes. “The city of Bozeman supports, celebrates, encourages and benefits from its diversity,” Taylor said. Bozeman Police Chief Steve Crawford said the fliers sent an alarming message, one that hits to the core of citizens’ sense of safety. “This is a community that doesn’t stand for that,” Crawford said. And the police department “is committed to keeping all members of our community safe,” Crawford said. Gallatin County Sheriff Brian Gootkin said regardless of religious or political beliefs, hate messages are not what this community is about. “Just because it’s not illegal doesn’t make it right,” he said. Religious leaders encouraged a response of love, of acceptance, of respect. “We need to treat each other with dignity,” implored Rabbi Chaim Bruk of Chabad Lubavitch of Montana. “We all together will return hatred with love,” Al-Kaisy said. But McDevitt said that “goodness is stronger than evil” and if the community sticks together, the air will clear. Rabbi Ed Stafman of Bozeman’s Congregation Beth Shalom wondered why the person or people who left these fliers behind did it in the anonymous darkness of night. Travis McAdam of the Montana Human Rights Network told the crowd that events like Thursday’s were the perfect response to hate. “We come together and stand together as often as we need to,” he said.